Nothing could stop Pete Anderson Jr., #5 Western Late Model from Stockton, on Saturday night: broken parts, crashes, oil spills, bad luck. Nothing. 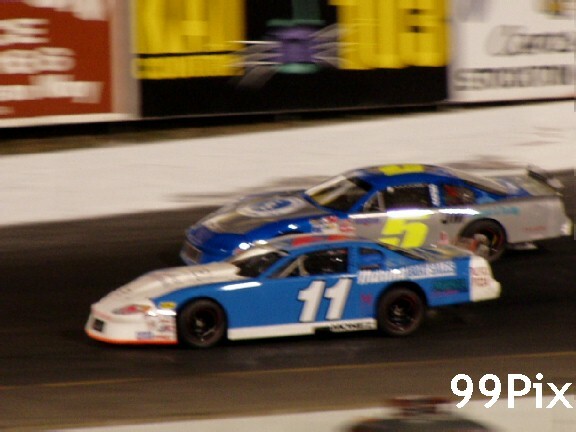 Anderson led from green flag to checkered flag in the Western Late Model 30-lap main event in front of 1,281 spectators at Stockton 99 Speedway. 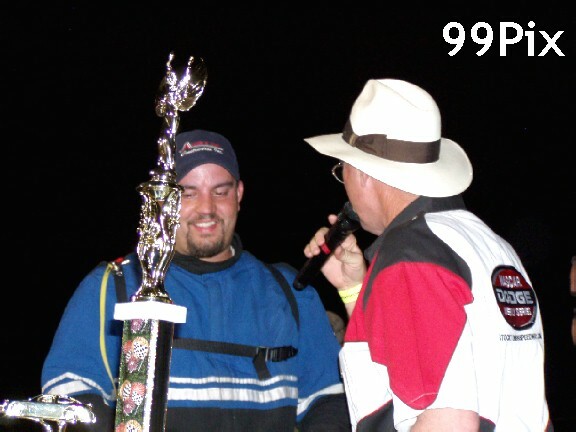 It was his third career Late Model victory and first since July 13, 2002. "All year, we've had a good car; just no luck," the Stockton driver said. "Hopefully, this turns it around for us." Anderson's year started with several thousand dollars worth of damage on opening day after he got into some oil and crashed. It grew worse before it got better. "We led races and broke. We got spun out," Anderson said. It was always something until Saturday. Anderson qualified third behind #57, Mike Garcia of Lodi and #32, Eric Humphries of Chowchilla, then won the trophy dash. Anderson took off at the green flag in the main and raced 30 smooth, incident-free laps. "I wish they could all go like that," he said. We were expecting this car to be good a lot sooner." There was even oil on the track. It made its way onto Anderson's windshield, but it didn't disturb his winning run. The big battle was for second place, far behind Anderson's clean-air run. #11, Chris Monez of Turlock, Byrd, Joey Stearns of Stockton and Guy Guibor of Manteca ran second through fourth from laps 18-25 until Byrd passed Monez for second on lap 26. Byrd had his three-race win streak snapped, but the points leader was happy with runner-up points. Stearns finished third, his best in the Late Model division. Charlie Clawson #15, of Modesto keeps winning. 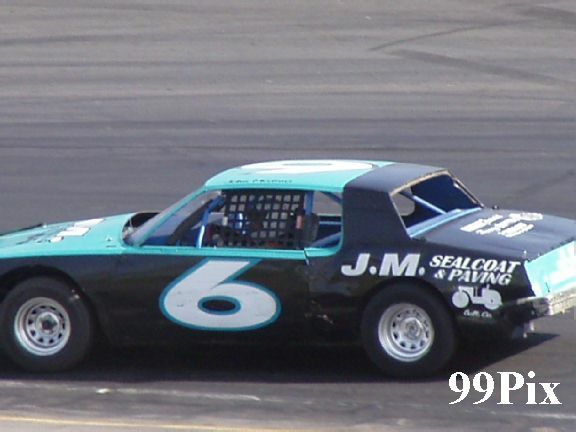 Clawson took the lead from #6, John Medina of Galt on lap 11 of the 30-lap main and drove to his fourth victory this season. Clawson nearly set a track record in qualifying but didn't sweep because of a third-place finish in the trophy dash. Clawson was timed in 16.658 seconds in qualifying. 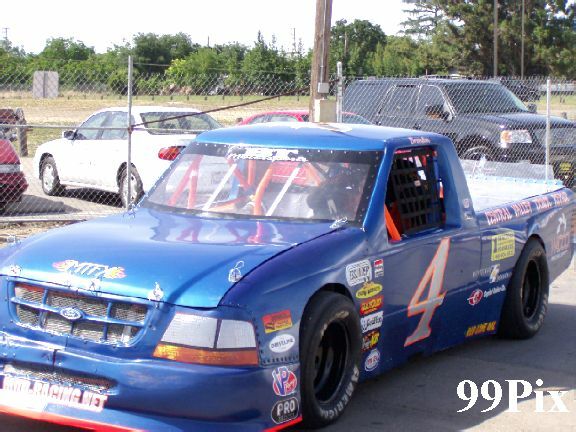 Michael Wendt set the Pure Stock record at 16.655 on April 19, 2003. Defending track champion Carrie Miller of Saratoga scored her fifth career victory and first this season. Miller was involved in an accident last weekend, so she drove her backup truck, which her brother, Chris Drysdale of San Jose, has been driving. Miller couldn't pass Brandon Trevethan, #4, of Tracy on lap seven, but passed him on lap eight and led the remainder of the 30-lap main event. 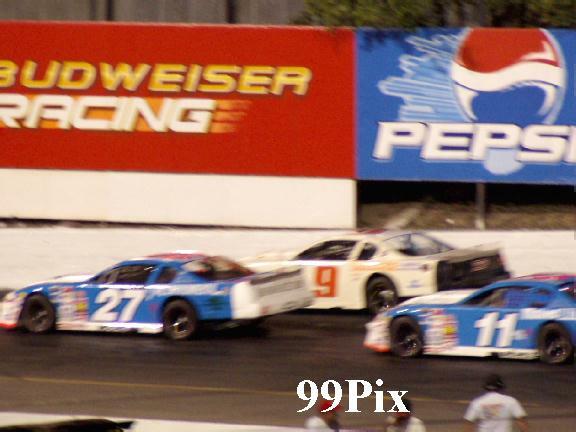 Miller, Trevethan and Dave Daniel of Salida ran 1-2-3 for the final 23 laps. Miller also won the trophy dash. Frankie Winchel, #14, of Sebastopol avoided a crash in front of him to take the lead on lap 23 and pulled away to win the 30-lap feature. 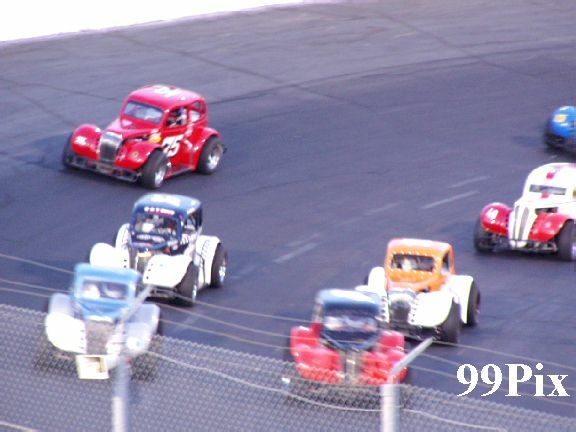 Richard Appleby, #83, of Yountville, Ryan Mosher, #52, of Cupertino and Winchel ran 1-2-3 from laps 16-22 before Appleby and Mosher came together and spun in the front stretch. Jeremy Wood of Tracy came back from a spinout on lap six to finish second. He tapped points leader Mark Bailey of San Lorenzo going into turn two on the final lap, got inside Bailey coming out of turn two, passed him in turn three and beat him to the checkered flag for second. STOCKTON, Calif. - Funny what a checkered flag will do for a man. 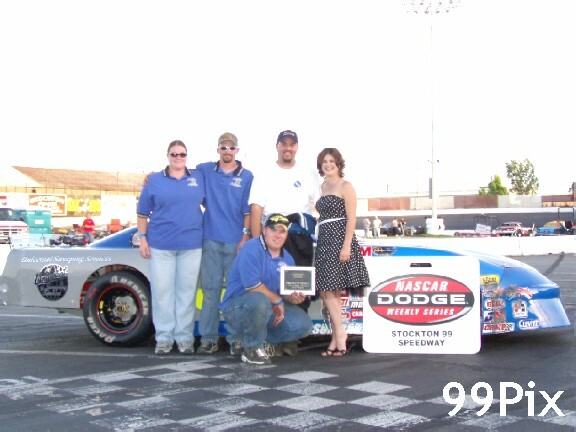 Pete Anderson Jr. of Stockton experienced the agony of defeat and then some at Stockton 99 Speedway this season before winning the Western Late Model 30-lap main event Saturday, May 1, in front of a crowd of 1,281.But with one wave of the checkered flag, all was forgotten, and Anderson wore one big smile. 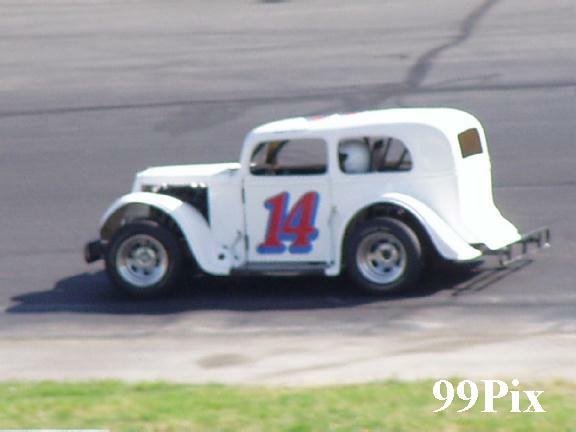 Forgotten was opening day in March, when Anderson's fast racer suffered about $5,000 in damages in a wreck. Forgotten was a winless April that included main-event finishes of 10th, ninth and ninth. Fresh in Anderson's mind on May 1 was a bolt to the front at the green flag and a clean race with no interruptions for caution flags or mechanical breakdowns. 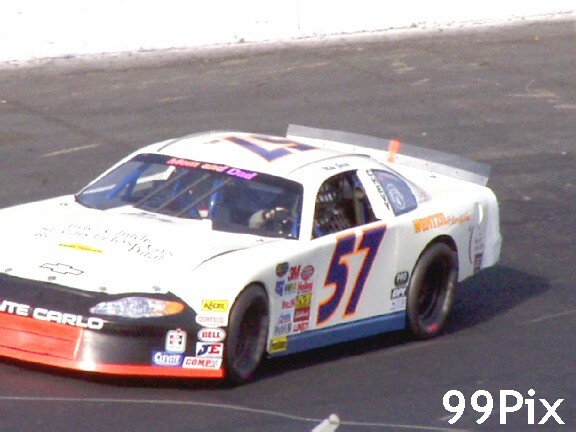 The victory was the third of Anderson's Late Model career at Stockton but his first since July 13, 2002. His No. 5 machine inhaled the clean air bestowed upon the race leader, and Anderson had nary a problem in snapping the three-race winning streak of points leader Dave Byrd of Monterey. "That was probably the best thing - getting the clean air," said Anderson, who qualified third in time trials at 14.588 seconds around 99's quarter-mile paved oval. "I wish they could all go like that. All year we've had a good car; just no luck. Hopefully, this turns it around for us." Anderson's wire-to-wire run was darn-near flawless, and he never was challenged for the lead. For Anderson and his followers, it was a long overdue and deserved victory. "We've led races and broke, got spun out," Anderson said, briefly recalling the unlucky past without letting it cloud the enjoyment of his victory. Bad luck was out there - in the form of one car or more spewing oil - but it wouldn't stop Anderson on this night. He also won the trophy dash. "I got oil on my windshield. I don't know who it was," he said. Byrd also spotted it in his battle for second place in the main. "Two cars were spraying oil like a fan," the two-time track champion said. "It got to be an equalizer." Byrd wheeled Tim Gillit's beige No. 9 to second place in the main, which didn't hurt him in track points and helped set him up for a high standing when the NASCAR Weekly Racing Series regional points come out for the first time this season soon. "It was a good night for us, a great night for us," said Byrd, who three days earlier kicked around the track and pits at Infineon Raceway in Sonoma watching Nextel Cup and Southwest Tour hotshoes test the road course. Byrd ran third to Chris Monez of Turlock in the main until passing him on lap 26 of the 30-lap feature. Late Model rookie Joey Stearns of Stockton finished a season-best third, Guy Guibor of Manteca was fourth and Monez fifth. In other main events, Charlie Clawson of Modesto won another Pure Stock main event, defending track champion Carrie Miller of Saratoga claimed her first victory this season in Pro 4 Truck, albeit in a backup pickup, and Frankie Winchel of Sebastopol claimed the Legends feature. "We haven't lost an A main yet," said Clawson, who was disqualified for illegal heads following one victory but otherwise has dominated the class this season. "We changed to stock heads that are faster. Originally, I wasn't running for points. Now, it's maybe." Clawson nearly set the track record - at 16.658 in qualifying he fell three-thousandths of a second short of the record Michael Wendt set April 19, 2003 - but Clawson's third-place finish in the trophy dash prevented him from a sweep. 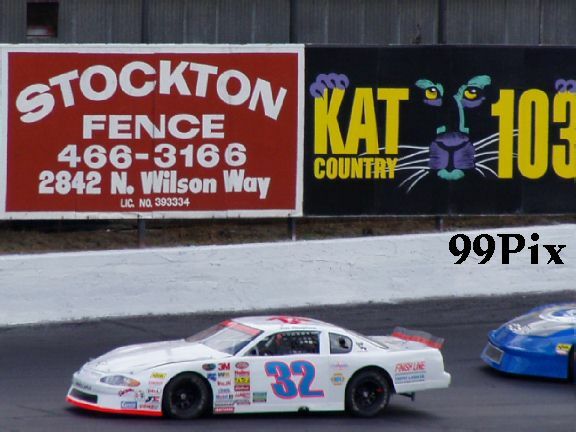 Clawson took the lead from John Medina of Galt on lap 11 of the 30-lap main and won two restarts with Medina on laps 17 and 28. Miller took over the steering wheel in her backup truck from brother Chris Drysdale and qualified No. 3 and won the trophy dash. Drysdale went into the night with a six-point lead over his sister, and he finished 11th -- last -- in the backup vehicle of Tracy's Randy Jahoda. Winchel took the lead late in the Legends main when leaders Richard Appleby of Yountville and Ryan Mosher of Cupertino locked up in the front stretch. Jeremy Wood of Tracy passed Mark Bailey of San Lorenzo for second on the final lap.